Trade Liberalization in India and the Regional Comprehensive Economic Partnership (RCEP) agreement. Last month, India abruptly changed tack by expressing its willingness to drop three-tiered approach on tariff liberalization under the proposed Regional Comprehensive Economic Partnership (RCEP) agreement. This was communicated to trading partners at the fourth RCEP Ministerial Meeting held in Laos on August 5. India has been one of the key proponents of the three-tiered approach on tariff reduction under RCEP. What led India to change tack? The precise reasons behind this policy shift are not yet publicly known but media reports suggest that India has made this offer conditional on getting higher levels of commitments on trade in services and investment from other member-countries of RCEP. Unlike majority of RCEP nations, India has an offensive interest in seeking greater liberalization of trade in the IT and IT-enabled services (ITES) due to its globally competitive IT sector which is the largest contributor to services export. While India may adopt a more cautious approach towards banking, retail trade and legal services. India has been seeking easier visa regime for the movement of IT and other service professionals in the RCEP member-countries. However, most RCEP members are unwilling to extend any meaningful market access to Indian service firms. On investment issues too, there is a yawning gap between India and other member-countries. On the other hand, India has defensive interests in agriculture commodities and manufactured goods (except pharmaceuticals and textiles). In terms of manufacturing, India remains one of the most uncompetitive big economies in this region despite its huge market size and diversity. In contrast, RCEP countries like China, South Korea and Japan are export powerhouses in manufactured goods and have strong offensive interests in opening up the goods market of India. Likewise, Australia and New Zealand are pressing for lower tariffs to gain greater market access in India’s food, wine and dairy sectors. As compared to early harvest approach favored by other member-countries, India intends to achieve a single undertaking agreement which allows trade-offs across sectors during the negotiations. For India, RCEP would be, by far, its biggest free trade agreement and the country may have to offer deeper commitments than already made under its existing FTAs with ASEAN, Malaysia, Singapore, South Korea and Japan. 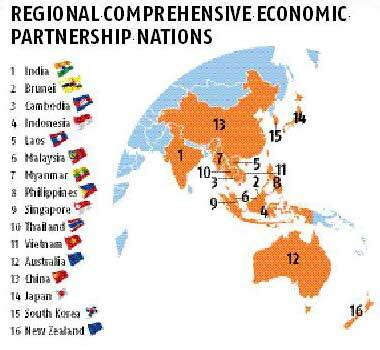 RCEP is a proposed mega regional free trade agreement between sixteen countries (10 ASEAN countries and their six FTA partners, namely, Australia, China, India, Japan, South Korea and New Zealand. If accomplished, RCEP would pave the way to the creation of the largest free trade bloc in the world, covering 45 percent of the world’s population with a combined GDP of US$22 trillion and accounting for 40 percent of global trade. The legally binding RCEP covers a wide range of issues including trade in goods, trade in services, investment, intellectual property rights, competition policy, dispute settlement and economic and technical cooperation. The negotiations were officially launched in November 2012 at the ASEAN Summit in Cambodia and the 14th round will be held at Vietnam during August 15-19, 2016. The core interests of RCEP member-countries are very diverse thereby delaying the conclusion of negotiations. Given the slow pace of negotiations on other key pillars (trade in services and investment), it is unlikely that this mega regional economic integration pact could be sealed this year. Under India’s three-tier approach, tariff reduction was based on whether it has a FTA with the member-country of RCEP or not. As noted above, India has already signed FTAs with ASEAN, South Korea and Japan. In tier-I, India offered 80 percent reduction in tariff lines to the Asean countries. Out of which, 65 percent will come into force once the RCEP agreement is enforced and the rest 15 percent will take place over a period of 10 years. In tier-II, India offered 65 percent tariff elimination to South Korea and Japan while these two countries have reciprocated with 80 percent threshold over a decade. The tier-III relates to countries with whom India has not yet signed any FTA. In tier-III, India offered 42.5 per cent reduction in tariff lines to China, Australia and New Zealand while each of these countries offered 42.5 percent, 80 percent and 65 percent, respectively. In contrast, the single-tier system – where all member-countries get same reduction in tariff lines – is likely to pose a much higher competition threat to Indian producers. Concerned about the possible negative impacts of RCEP, strong apprehensions have been expressed by the industry associations and farming communities in India over the cheaper imports (such as steel, chemicals and electrical goods from China, plantation crops from Asean countries, wheat and wine from Australia and dairy products from New Zealand) flooding the domestic market and driving local producers out of business. Even the proponents who view RCEP as an opportunity for Indian economy to be globally competitive do acknowledge that the fear of being swamped by cheaper imports is real and the proposed pact could negatively affect the livelihoods of small producers and workers if safeguard measures are not adequately incorporated in the proposed pact. In particular, much of concern is related to import of cheaper manufactured goods from China. In 2015, India’s trade deficit with China widened to a whopping $51.8 billion. With a bilateral trade of $71.2 billion in 2015, India’s exports to China were $9.6 billion while imports were $61.5 billion. Over the years, China’s exports have been growing at a much faster pace than India’s. This is despite the fact that India has frequently used anti-dumping duties, safeguard duties and other countervailing measures to protect the domestic industry from unfairly low-priced imports from China. During 1994-2014, there were 134 cases where India imposed anti-dumping duties on goods from China. Much of the stiff competition from Chinese imports is in products manufactured by India’s micro, small and medium-sized enterprises who have been demanding curbs on cheaper imports. India also runs a trade deficit with other RCEP nations – Australia, South Korea, Japan, Malaysia and Indonesia. The current debate misses a key point that India joining RCEP could result in significant tax revenue loss as the country imposes higher MFN applied tariff rates (on both manufactured goods and agricultural products) in comparison to other RCEP nations. According to Mint, commerce ministry officials have estimated that the potential tax revenue loss from joining RCEP could be around 1.6 percent of country’s GDP. For India, there is no point in entering into this mega regional trade agreement without assessing the impacts (positive and negative) of its existing bilateral trade agreements with other RCEP members. India’s recent experience of FTAs with Japan, South Korea and Asean countries has not been very positive due to myriad reasons. Post-FTA, bilateral trade volumes have increased but imports from partner countries have increased at a faster pace than India’s exports with partners. Due to its relatively higher tariff regime, India had to reduce tariffs much more than partner countries. Take the case of India-ASEAN FTA. Post-FTA, India’s imports from ASEAN rose by 79 percent while exports grew by 39 percent. Despite India’s active FTA policy, Indian exporters have not been able to achieve greater benefits from existing FTAs due to low awareness and cumbersome rules. According to the estimates of Asian Development Bank, utilization rate of India’s FTAs varies between 5 and 25 percent – one of the lowest in the region. Further, studies have found that large enterprises are more likely to use FTAs than SMEs. As far as services sector is concerned, India was unable to secure greater market access in its trade pact with ASEAN. In the case of bilateral trade agreements with South Korea, Japan, Malaysia and Singapore where India successfully negotiated the Mutual Recognition Agreements (MRAs) – aimed at facilitating movement of IT and other service professionals – anticipated gains have not yet materialized because of poor enforcement of MRAs. For India, the policy priority should be to address the deficiencies of existing bilateral FTAs with RCEP members through the established review process rather than entering into mega regional FTAs like RCEP and TPP. There is no denying that by being not part of RCEP, India may incur losses on account of trade diversion. But joining this mega pact would entail substantial economic and social costs. Unlike Australia, Japan and New Zealand, India lacks a comprehensive social safety net to fall back on. The threat of millions of Indian farmers, workers and self-employed entrepreneurs losing their jobs and livelihoods due to cheaper imports from RCEP member-countries cannot be underestimated. Close to 93 percent of India’s workforce is in informal sector. India’s FTAs with ASEAN and other East Asian countries are often viewed as integral parts of “Look East Policy” which was formulated by the Narasimha Rao government way back in 1991. Since then, the successive governments have taken myriad steps towards deeper and more institutionalized economic integration with this region. There is nothing per se wrong in enhancing India’s influence and strategic position in the world but the time has come for the Government to share its assessment whether these FTAs are helping in achieving geo-political and other non-economic interests in this region or elsewhere. One of the major lacunae in India’s FTA policy is very limited consultation with all relevant stakeholders. The number of domestic consultations on RCEP held, so far, are not adequate given the size, depth and diversity of Indian producers. To avoid repeating the same mistakes over and over again, the Indian authorities should involve all stakeholders into the consultation process. Besides, the government must initiate in-depth research and analytical studies to measure cross-sectoral and intra-sectoral impacts of RCEP. In India and elsewhere, free trade agreements currently do not enjoy much support from the public. In recent years, the public view of free trade pacts has grown more negative. Therefore, it is very important for the Indian authorities to seek active engagement of farmers’ groups, industry associations, service providers, labour unions and NGOs in the process. Export-led growth has been a dominant paradigm for East Asian economies. However, the global financial crisis of 2008 and the subsequent recession in developed countries have revealed the vulnerabilities of export-led growth model and currently serious questions are being raised whether other economies should emulate this model to promote development. China, the world’s second largest economy, is currently attempting to move away from export-led investment-fueled growth model towards a more consumption-led model so as to reduce dependence on falling exports. Unlike China, South Korea, Japan and other East Asian countries which follow export-led growth model, bulk of India’s growth emanates from domestic consumption which constitutes nearly 70 percent of GDP. Due to weakening of external demand and growing protectionist sentiments around the world, India will have to pay greater attention to boost the domestic demand in the short and medium-term. In the present global context, the chances of India becoming an economic powerhouse through exports are very slim. Already there are strong protectionist sentiments against India’s software and services exports industry in key markets. Instead of expanding global footprint through FTAs, India should first focus on strengthening the domestic productive capacities and mobilizing resources to improve the physical and social infrastructure. Brunei, Cambodia, Indonesia, Lao, Malaysia, Myanmar, Philippines, Singapore, Thailand and Vietnam.